The mean salary for a paralegal in New Hampshire is currently about $44,250, with an average hourly wage of $21.27. The majority of paralegal employment is provided by private law firms in New Hampshire; however, corporate entities and different government branches employ legal assistants as well. The New Hampshire Supreme Court Administrative Rule 25 states that paralegals are professionals “not admitted to the practice of law” working under a lawyer. 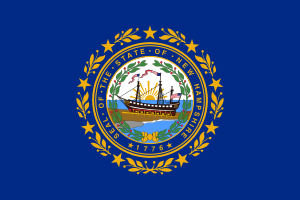 New Hampshire, like the rest of the nation, allows only licensed lawyers to practice law and prohibits paralegals from providing legal services without the supervision of an attorney. The state of New Hampshire does not provide oversight for any official license or certificate requirements for legal assistants. To become a professional with the paralegal title, aspiring legal assistants can earn a certificate or degree at a school and pass an approved exam, or become a paralegal through employment. However, earning a certificate or degree from a credible program will open up more employment opportunities and provide a leading competitive edge when applying for jobs. Another option is to receive some financial assistance from an employer that supports their legal assistants’ pursuit of a certificate. Aspiring paralegals in the state of New Hampshire earn their official certificate when they pass one of several approved certification exams from either the National Association of Paralegals (NALA), the National Federation of Paralegal Associations (NFPA) or the National Association for Legal Professionals (NALS). Paralegals or paralegal students should also consider joining a local organization, such as the Paralegal Association of New Hampshire. These professional groups provide several benefits to their members, including exclusive employment opportunities and valuable network ties with other paralegals and employers. Deciding on an institution for paralegal education can seem daunting at first, especially with so many online scams around. To start with, it’s a good idea to choose a program that has been endorsed by the American Bar Association (ABA), which is a national organization that also oversees, regulates provides licenses to lawyers. An approval from the ABA proves that the college or program provides a quality legal education. Many, but not all, employers will only hire a paralegal holding a certificate or degree from an ABA-endorsed program. Another factor to consider when looking at education options is a school’s accreditation status, which is earned through the US Department of Education. Accredited institutions have been proven to be legitimate with a high standard of academic ethics, and employers may require a certificate or degree from an accredited school, in addition to an ABA-endorsed program. Other employers may require only one or the other, or even may have no requirements at all. If possible, it’s best to take an ABA-endorsed program at an accredited institution. New Hampshire Technical Institute, now known as Concord’s Community College, is a public 2-year community college located in the city of Concord. Students here may attend its Paralegal Studies Certificate program, which takes about 25 credit hours to graduate. Specific admission requirements apply to this program, and classes are currently held only in the evening. Internships are encouraged, but not mandatory.